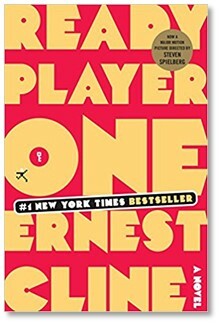 I just finished the book Ready Player One by Ernest Cline, also known as The Greatest Story Ever Told. What do I mean by that? I don’t think I’ve ever come across a more heavy-handed retelling of the gospel narrative in a novel. Nor have I had more fun with a novel than this one. It’s as if Cline aimed this book at people born in 1972 and weaned on 80’s pop-culture. The book is a nostalgia-filled Geek-fest for readers like me. The story is set in the United States in a dystopian future in the year 2044. The main character, Wade Watts, is an awkward teenage gamer and computer hacker. Wade and every other person on the planet escape the daily gloom by immersing themselves in an online world called the OASIS (Ontologically Anthropocentric Sensory Immersive Simulation). An eccentric recluse billionaire genius named James Halliday created the OASIS and left his fingerprints all over the world he had made. In a nutshell, the OASIS is an homage to Halliday’s childhood love—80’s pop-culture. Upon his death, Halliday left a video message for the world announcing a contest in the OASIS. The contest requires players to locate three hidden keys that lead to an “easter egg” hidden deep within the OASIS. The first player to locate the three keys and find the egg wins. The victor not only wins the game but also wins Halliday’s multi-billion dollar fortune. The only way to advance in the game is to become a devotee of its creator. The most serious contestants are called “Gunters” (a contraction of “egg hunters”). The Gunters love and revere Halliday. They devote themselves to learning everything they can about him—everything he’s written, the movies he loved, the music he listened to, etc. They are purists because they revere the creator of the OASIS and want to master the world he created. An evil corporation called Innovative Online Industries (iOi) is also playing the game and trying to win Halliday’s billions. Led by the sinister Nolan Sorrento, the iOi has countless gamers in their employ playing the game. Sorrento and iOi will stop at nothing to gain control of the OASIS so that they monetize it, enrich themselves, and subjugate the masses. The game is so difficult, no one can even find the first key for many years after Halliday’s death. Enter the main protagonist, Wade Watts, a poor kid who outgames everyone and eventually finds the first key. And then they are off to the races. Here’s the deal, Wade. You’re something called a “human being.” That’s a really smart kind of animal. Like every other animal on this planet, we’re descended from a single-celled organism that lived millions of years ago. This happened by a process called evolution, and you’ll learn more about it later. But trust me, that’s really how we all got here. There’s proof of it everywhere, buried in the rocks. That story you heard? About how we were all created by a super-powerful dude named God who lives up in the sky? Total b—sh–. The whole God thing is actually an ancient fairy tale that people have been telling one another for thousands of years. We made it all up. Like Santa Claus and the Easter Bunny. On the other hand, the author creates a virtual world within the dystopia that is anything but godless. In fact, the OASIS has a creator. It has life. It has death. It has a purpose—a purpose put in place by the creator who invited players into his game. There are so many contact-points with the biblical storyline within the OASIS that it is hard to know where to start. Not long after Wade Watts obtains the first key, he goes through a wilderness temptation of sorts. The evil Sorrento essentially offers him the creator’s kingdom. All Wade had to do was come to work for Sorrento. Wade refuses every one of Sorrento’s temptations. In the course of their conversations, it becomes clear that Wade loves the creator while Sorrento despises him and is willing to steal, kill, and destroy in order to win control of the OASIS. When Wade finds the first key, he leads all the other Gunters to it as well. No one would have begun the creator’s quest if Wade hadn’t led them to the first key. Eventually, Wade finds all three keys making friends (and disciples) all along the way. The story climaxes in a great battle between Sorrento’s forces and Wade’s fellow Gunters. But on the way to the final gate, Sorrento deploys a super-weapon that kills everyone on both sides and lays waste to the world. Everyone dies, including Wade… until… Wade finds himself alive and alone after all others are dead. It turns out that Wade had completed a perfect game of Pac Man earlier in the quest (a feat no one else in the OASIS had done except for Halliday the creator). Because Wade completed the perfect game, he alone had earned another life. So Wade was resurrected and able to complete the quest for the Egg. In the final challenge, the only way to win was to know what the creator loved above all else—a piece of knowledge that Sorrento and his forces surely never understood. After Wade completes the challenge, the creator Halliday himself appears and gives ownership of the OASIS to Wade. Have you heard this story before? I know I have. There are so many points of contact with the biblical storyline, I couldn’t even begin to recount them all here. And that is what makes this book so remarkable to me. The author is clearly not writing this book from a Christian perspective. The “real” world is a godless dystopia. And it is filled with all the hopelessness and filth that you would expect. And yet, Halliday’s world has a creator, a savior, a trinity (“somewhere in the ancient mystic trinity, you get three as a magic number“), a wilderness temptation, a resurrection, and a new creation. The author doesn’t believe in Christianity, and yet he creates a world with sympathetic parallels to the Christian one. Perhaps this is the author’s way of saying that the greatest story ever told is a fiction. Or perhaps a little less cynically, maybe it was his way of saying that he loves that story and wishes it were true. I don’t know. I was cheering at the end of the book. I wish I could say that I felt the same for the movie. I was so excited about the book after finishing it that I could hardly wait to see the film, which I watched last night. I wish I hadn’t watched it. It was awful on a number of levels, and I do not recommend that you watch it. I have never seen a film adaptation more different from its source material. I thought it would have been better since Ernest Cline himself wrote the screenplay. I’m mystified that the author could have produced such a horrible adaptation, but I guess it’s no more mystifying than George Lucas’ infamous parentage of the prequels. Even the greats can lay an egg, and the movie version of Ready Player One was a big time lemon. It felt just like all those songs and poems had promised it would. It felt wonderful, like being struck by lightning. It occurred to me then that for the first time in as long as I could remember, I had absolutely no desire to log back into the OASIS. In the end, the events of the OASIS lead Wade back to the real world—a real world with love and beauty and truth, realities that would make no sense unless the story hiding in OASIS were true. One Bonus Thingy: In the final quest, the number three becomes the solution to completing the quest. Through an old “School House Rocks” episode, Wade finds out that it takes a “trinity” of players to unlock the final gate. Last night, I looked up the old cartoon on YouTube. I hadn’t seen it for years and had forgotten the lyric at the beginning: “Somewhere in the ancient mystic trinity, you get three as a magic number… faith and hope and charity.” See below. Revoice is over. Now what?